A chronicle of adventures and misadventures of a Celiac diva. It started like any other day. Well, maybe not any other day. I mean, how many days do you walk out to your car and the snow is piled so high that you have to shovel to get the door open? I have to give much MUCH love to my neighbor. He was out clearing the sidewalk in front of his building. He came to my rescue. He completely cleared away the snow so that I could actually drive to work. I owe him big time! I think I shall pick up a Starbucks card for him tomorrow. He earned it! Now back to my normal day. I drove to school. It really took no longer than normal. Thank god they got the main roads cleared! I left early, so I had enough time to quickly stop at Starbucks for a chai (why didn't I think to pick up the giftcard then??!?!?!) Normal kids, although fewer of them since the school buses were not running. They were not too crazy considering. Lunch: leftovers. Yum! I taught fifth grade. Fine (even if it took them forever to do one of the activities. Think kids, think!) Then the fifth graders were lining up and I was paged to come to the office. I sent a student. As my kindergarten babies were lining up to enter my room she returned...with a florist box. What the what???!?!!?!?! Flowers? Surely not for me. I'm not in a serious relationship. I can't even say that I am in any relationship. A few dates, but dating? Nope. Hhhmmmm? 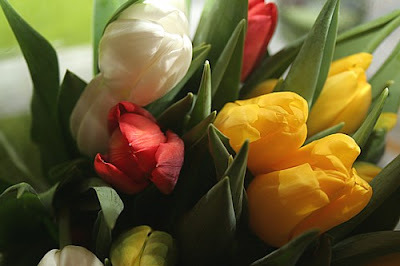 I open the box and see a beautiful bouquet of tulips. ::sigh:: I adore tulips. I check the card. Well, bowl me over! How sweet and unexpected. How slightly odd. A boy I know, and have been out on two dates with, sent me flowers. Two dates does not a relationship make, but I guess this means he really likes me. Wow. Hrm... I need to think about this. Am I interested? Not so sure. Must consider carefully. That was treat number one. Number two was one I gave to myself. Tonight's dinner: fancy mac n' cheese. But I did not want to make a huge meal. Too tired to do any "real" cooking. What is in my fridge? Ah ha! a couple good spoonfuls of pesto. While the lion is the king of the jungle, and Prince Charles will someday be the King of England, coconut milk reigns supreme as the king of my cupboard. I know I have posted in the past about my love of coconut milk. I have slowly begun to discover the depth of that love. In particular, how much I love utilizing it for quick, easy seafood dishes. Used as a sauce base you can make so many flavorful meals. Want something thick and creamy? Regular coconut milk. Want the flavor, but a little less rich? Lite coconut milk. The flavor is not overwhelmingly strong and blends beautifully with spices from the far east. You can create luxurious meals with very few ingredients. Tonight I needed to cook up some salmon that was sitting in my fridge. I hate to see a good piece of salmon go to waste. We had reached the moment of cook it or get rid of it. What to make? I have never poached salmon before. I'm not entirely sure tonight's meal would qualify as such, but that is where my idea came from. Take the salmon (two "portions"), a can of coconut milk, can of tomatoes, onion and spice. Simmer. You are done. So easy! The most time consuming part was slicing the onion. In a large saute pan, saute the sliced onions in enough olive oil to coat the pan. When the onions begin to become transparent add the spice blend, toasting the spices (approx. 1-3 minutes). Pour in the coconut milk and tomatoes, mixing thoroughly. Bring sauce to a simmer. Place the salmon portions in the sauce, submerging completely. Cover the pan and simmer until salmon is cooked through. Serve over rice or rice noodles. Sadly (for you), it was so yummy that I forgot to take a photo before devouring it all. Try flaking the salmon once it is cooked. You can get a wonderful mouthful of salmon, sauce, and veggies every time. I will definitely be repeating this recipe. Next time, red bell peppers! One of the items that I have missed the most since going gluten free would have to be cookies. Sure I could bake some, but I don't always have the time or energy. Sometimes I just want to open a box or bag and start munching. Oh lord, the oreo cravings are bad! I tried some Glutino chocolate sandwich cookies, but that are just not the same. I suppose they are fine cookies, but...where is the crunch? Where is that indefinable quality that makes you eat half the package of oreos with a tall glass of milk even though you know you will be queasy in an hour? Sadly, I fear I will never find it in a gluten free cookie. As for chocolate chip...homemade is still best. A couple of weeks ago I tried the Enjoy Life Chocolate Chip Cookies. They were ok. Completely soft. Iffy texture. Passable flavor. I have to admit to being a Toll House girl. Today I decided to brave the Enjoy Life and their cookies again. This time I tried their snickerdoodles. Now these are tasty. They probably have the same texture, but I am used to my snickerdoodles being soft. The flavor is sweet and strong. Yum! I finished the two-cookie snack pack and wished I had more. My only beef is that they are tiny! Tiny, I say! But oh so good. So local gal, Jenni of Chronic Babe, and I were talking a few months back. She is a contributor to the Chicago website, Gapersblock. While she does not have Celiac, she does understand the issues faced by individuals with a chronic illness and/or dietary restrictions. After a few months of "will we, won't we" an article was written. It is a focus on Celiac, food allergies, and eating out in Chicago. I am the "tasting expert" and contributed a little sidebar of helpful hints. Go read it! She did an excellent job. I am very proud of what we put together. Hopefully it will open a few new eyes to the gluten free lifestyle. Sometimes when I get home from work I am just too tired to cook. I stare at the contents of my empty fridge and wonder "What the heck am I going to eat?" I mean really, what kind of meal can you possibly make from blackberry yogurt, a wedge of parm, and some slimy looking spinach? It used to be so easy. I would pick up the phone and order any number of tasty (if not healthy) meals: pizza, crab rangoon, fallafel sandwich. These days? Not so much. The concept of fast food has turned from picking something up at a local eatery, to what I can throw together with minimal effort and maximum flavor that will provide enough leftovers for my lunch the next day. Oh yes, and not get sick from eating it. All of those lovely prepared sauces and meals are loaded with gluten: wheat, modified food starch, malt flavoring. Yikes? So what is a gluten free diva to eat? Peanut Coconut Shrimp, that's what. I am getting a bit ahead of myself. See, I finally was fed up with lazy-night meals consisting of apples, cheese, GF crackers, and dried mangos. I turned to my pantry. It is not stocked as well as it should be. I have to admit that. I am long overdue for a major shopping trip. (My apartment is a mess right now and the thought of bringing bags of anything into it is not inspiring.) It has been interesting to witness the evolution that has taken place in my pantry over the past three and a half months. So many of the items that were once staples have disappeared to be replaced by new, shiny items. The following is a list of must-haves for my pantry. What do you always keep on hand? I know there are things I am forgetting. Making this list has highlighted just how badly I need to hit the store. No wonder I have been unable to cook lately! 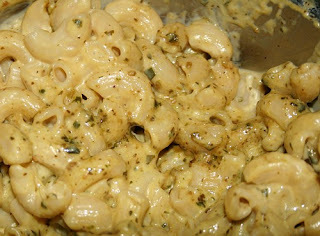 I my perusal of the pantry last night I decided to pass up the pesto and make something with coconut milk. What, you ask? I had no clue. I just knew at that moment I must use coconut milk. Now usually my store only carries the low-fat variety. This was the real thing. Wow! So different! This stuff was thick. So incredibly rich. Gah! I could eat it with a spoon! ehem. I was trying to think of ways to utilize this decadent ingredient. Chicken or shrimp? Curry? Green chilies? Soup or sauce? Then I looked at the label. hmmm...recipes on the website? OK, why not? A Taste of Thai was already one of my favorite companies due to the fact that they label all of their foods GF (when applicable). Now I love them more for their website. All my favorite Thai dishes are on there. You can order their products online (there are so many my store does not carry!) I browsed the recipes and found Peanut Coconut Shrimp. I made a few modifications since I did not have all of the exact ingredients on hand. So with no further delay, the omg-yummy-so-good dish. In a medium pot bring water to a boil. Add rice. Reduce heat to simmer, cover, and cook for 15-15 minutes (until rice is tender). While the rice is cooking, combine all remaining ingredients in a small sauce pan over medium heat. Bring to a boil. Turn off heat. Stir in frozen shrimp. Let sit as the rice finishes cooking. To serve, just spoon shrimp and sauce over rice. God, so good. For the last five years I have been trying to find an at home version of the peanut sauce from my favorite Thai restaurant. Who knew it would take developing Celiac to finally find the right recipe? Go make this dish. Add veggies (I know I will next time). Use it as a dip, put it on rice, or just eat it with a spoon. Yes, it's that good. So good that I ate it too fast to take a picture. Maybe next time. What to say about me? I talk to much. I love to dance. I have wonderful friends. I am an adult (when did that happen?) I am passionate about teaching and creative expression. I wish I could travel more. I like to think I’m a good photographer, but then I see that work of others and know how much I have yet to learn. I love to try new things, yet sometimes am resistant to change. I have Celiac Disease and am just starting my journey through this new gluten free world. I cry. I laugh. I give great hugs.